Incredibly stylish, like a top hotel.Sit down food menu. Delicious.Rothschild champagne, delicious cocktails.Varied seating areas for all moods. Access: OneWorld Emerald on OneWorld flight in any cabin or First Class on OneWorld airline. When it comes to food- looks help, but it’s all about the taste. For the first time in all of my wildly extensive travels I can absolutely proclaim that the food in the lounge was on par with anything you’d hope to find in a restaurant outside of an airport. Quality ingredients, beautiful plating and wonderful service. I had the Tuna Niçoise followed by the Hong Kong Noodles, both of which were delectable. And for you champagne fans out there, be sure not to miss the hard to find Rothschild Champagne, a real treat! Yes, your eyes are dialed in. There are foot massages, private relaxation rooms, showers and everything else which could benefit a weary traveler. The place is truly magic. 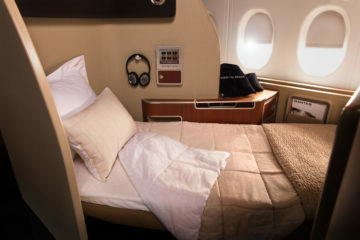 Even those looking forward to a first class flight with Cathay Pacific or another OneWorld partner will struggle to leave the space. It’s so wonderfully refined, thoughtful and attentive that one simply could not ask for more. You’ll love it. Next Article100% Bonus On Hotel Points, Delta Offering Free Meals In ECONOMY, Amex SPG BONUS!